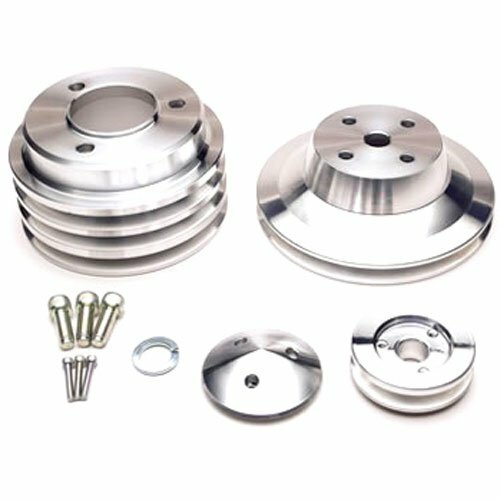 March Chevy Serpentine Conversion Pulley Sets are precision CNC machined for small and big block Chevy applications from 6061-T6 aluminum for extra strength, wear and to run perfectly true. These 3-piece sets include crank, water pump and alternator pulleys and are available in two ratios; Performance for limited street/racing applications and High Waterflow for daily drivers. They increase horsepower by reducing drag plus help eliminate belt slip and throwing. Finished with a ''No Polishing'' clear protective powdercoat for a maintenance-free finish! Uses a smaller performance crank pulley and larger water pump pulley to increase horsepower by reducing accessory drag, with typical gains of 12-15 horsepower at the rear wheels. Increases cooling by speeding up water flow and fan speed. This helps at critical low speed driving where most overheating occurs.